Many many years ago, I tried yoga. I had a VHS tape. There was a woman with a very calm voice, who wore all white, talking about Iyengar yoga. She emphasized form as we moved from posture to posture. Things like Proud Warrior, Triangle Pose, Downward Facing Dog, Legs up the Wall, and finally ending in Corpse Pose (don’t think she called it that) falling into blissful relaxation. I liked it, but I didn’t “get it.” I didn’t get that deep connection you’re supposed to feel, so I eventually got bored and moved on. Later, through other workouts, I learned about sun salutations, but yoga in general remain a bit of a mystery. Cue May 2015. Lots of things are changing. I’m changing. I’ve been reading about living a cleaner, active lifestyle, so I decided to give yoga another shot. I searched on You Tube for videos I could follow. I found Adriene Mishler and her channel/website Yoga with Adriene. I liked her vibe, and she had a free 30 days of yoga program, which seemed like the perfect way to get myself started. 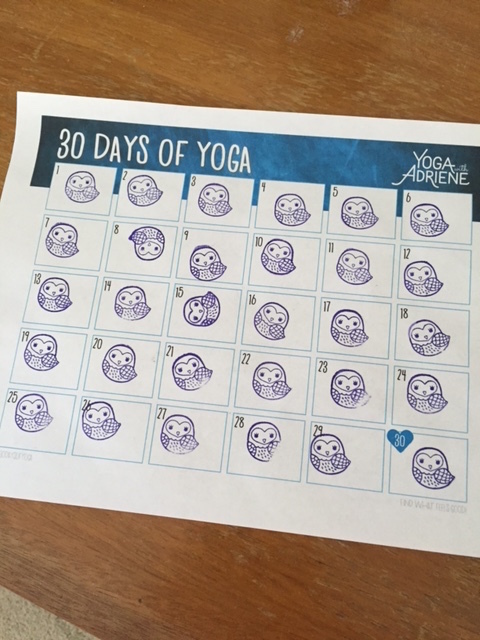 I printed up the calendar and was off to the yoga races. I’ve remained pretty flexible in my old age, but my strength and stamina have definitely been waning. We eased in with fairly well known postures. She explained things so clearly, talking about rooting into the earth through all ten fingers and the tops of your feet to create a stable tabletop position to work from. When standing she reminds us to connect to all four corners of the feet, rooting into the earth. She said things like “find what feels good” and “no yoga robots,” encouraging organic movement with the postures if that was what feels good. She gave breathing cues, which helped immensely. She used the sanskrit and common names for poses, encouraged setting intentions. I was enjoying it so much, some days I would do two videos. Eventually I added in a bedtime routine to help calm down and stretch out at the end of the day. My 30 days just ended yesterday, and I feel so much stronger already! Breaking out that yoga mat I’d had for years was one of the smartest things I have done in a long time, and I fully plan to continue practicing! My intentions are balance, strength, flexibility, and grace, things that I can apply to yoga and life. Yoga is making me happier and more mindful. I find myself wanting healthy food, lots of vegetables, fruit, and avocado toast. Ohhh, how I love avocado toast. I haven’t had alcohol in over two weeks and don’t miss it. I’m more active around the house, and my outlook and disposition have changed drastically. Most importantly, I finally “get” yoga. I understand the mind/body/breath/spirit connection, and the benefits that come from it. Yoga is not an exercise program. Yes, its exercise, but at the heart it is a practice. You will not be able to hold some poses in the beginning, you might not even be able to get into them, but don’t get discouraged and give up! Keep working and it will come to you. If you fall down, get up and try again, making any necessary adjustments. If yoga is completely new to you, take some time to learn fundamentals, like alignment, so you don’t hurt yourself. Breath, or pranayama, is SO important. Take some time to learn about it. Adrienne has videos on that, too. Lion’s breath is pretty fun, especially if you have kids. You don’t need yoga pants. Wear whats comfortable and won’t get in the way. I do my bedtime practice in my pajamas. You do need a yoga mat. I think its worth investing in a good, sturdy, sweat proof mat, but don’t break the bank. Other props like blocks are nice, but you can find substitutes. Yoga straps are nice, but you could use a mens tie, or something like that. Don’t do yoga on a full stomach. Give your food a few hours to digest, especially if you’re going to be bending over, going into downward dog, or inverting yourself in any way. This is self explanatory. Pay attention to what your body is telling you. If you’re in a pose and a muscle or joint is screaming at you, stop what you’re doing, adjust the pose, or take a rest. If you’re thinking about yoga, I say GO FOR IT! If you want a yoga buddy, just let me know, I’d love to have some! Namaste. Love and light to all! (Man I am turning into such a hippie).